Amman Imman takes pleasure in announcing that Royal Air Maroc, the flagship carrier of the Kingdom of Morocco, is a major sponsor of Ariane’s work in the Azawak. If you fly to Africa, fly RAM! Royal Air Maroc's support of the Amman Imman team's transportation needs has been a source of invaluable assistance for the team's continued work in the region. In the future, Royal Air Maroc plans to offer special trips for Amman Imman volunteers who want to visit the Azawak, especially as the establishment of water sources begins to bring the needed infrastructure to the region. 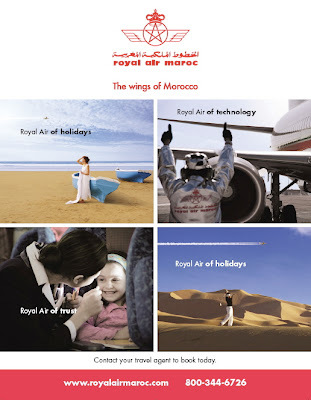 Fly Royal Air Maroc and vacation in exotic Morocco! click here to find out more. Also, Royal Air Maroc flies to multiple destinations in Europe, Africa and Canada...visit their web site to learn more www.royalairmaroc.com/ENG.